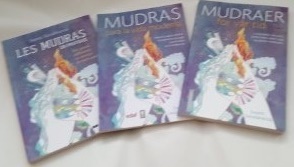 I’m very happy to announce that my book “Mudras for Modern Life” is now available in a number of foreign editions: Dutch, French, German, Spanish and Norwegian. In English it is available as a printed book, as well as an e-book. Please feel free to add comments to articles. Constructive feedback and dialogue are always welcome. Just click on the individual post that you would like to comment on - and then log in.